Not only is Acapulco an enticing place to go during a vacation but it enjoys a romantic and glorious history. 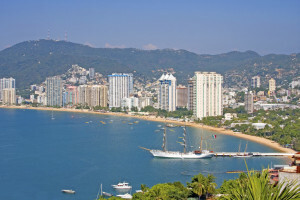 Originally, Acapulco was home to the Nahua Indians (who were predecessors to the Aztecs). However, recent discoveries have surfaced in the form of Petroglyphs (rock carvings made by removing a thin layer of rock to create an image) which are believed to indicate that previous settlements inhabited the region around 3000 B.C. Acapulco has had an incredible past including the Spaniard invasion, visits from famed pirate Sir Francis Drake, the Prince of Wales, and now many people who seek a beautiful vacation. Acapulco is a Nahua word mostly commonly said to mean “the place where reeds are destroyed.” This is based on a rather strange legend about Prince Acatl (cane or reed) who fell in love with the lovely Princess Quiahuitl (rain). Sadly, Acatl was unable to marry the Princess and wept so hard he became a mud puddle. In this mud puddle, reeds grew and Princess Quiahuitl, wandering the bay as a rain cloud saw what had happened. She fell upon the puddle, breaking the reeds which had grown, but finally uniting with her beloved Prince. No visit to Acapulco is complete without trying some of the delicious foods Acapulco is famous for. The homemade enchiladas (corn tortillas stuffed full of your choice of chicken, fish or beef) are some of the best in Mexico. In Acapulco, Tortillas are freshly made each day according to traditional custom, providing the freshest tasting enchiladas around. Another local favorite, tamales, are made of steamed cornmeal wrapped in cornhusks. The tamale filling usually consists of beef, chicken, or pork. Finally, the local Ceviche (marinated fish with the marinated consisting of a combination of lime, peppers, onion, tomatoes, olives, parsley, garlic, oregano, cilantro, and salt) is a treat you simply must try if you ever visit Acapulco. If you ever get to vacation in Acapulco, you will be glad you did. 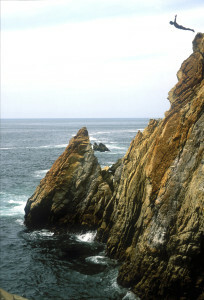 Some of the attractions (besides the resorts, beaches, foods, and night life) are the world famous diving cliffs. Divers make their dive from over 130 feet in the air, and dive into water less than 10 feet deep. El Fuerte de San Diego is an ancient fort (built to protect the city from Pirates) which is now a museum worth visiting even if you aren’t the historical type. Similarly, the Capilla de la Paz (Chapel of Peace) is an incredible historical site and one of the best places to view the bay and take pictures, even if you aren’t religious. Other attractions are the Isla La Roqueta, various murals, and archaeology tours, to name a few. During the cold winter months we often find ourselves dreaming of the beautiful beaches and mountains of Acapulco. Thought we can’t journey there, we can enjoy a margarita and some delicious tacos which is almost as good. If you would like to join us at one of our Acapulcos locations click here. You will almost feel like you’re on vacation as you enjoy our menu of enchiladas and combos with tamales.